Did you know that there’s not a “t” word that means: “predicament?” At least not one that I could think of or that Google could help me out with. I know because I looked so I could achieve maximum alliteration in today’s post title (#wordnerd). But that is entirely beside the point because this post is about two very different topics, which are only connected by the tenuous thread of one having been photographed on top of another. I took the 4 youngest to Goodwill last Friday because, between the red dirt and the sheet rock dust and the concrete floors and sub-floors and plywood that my children are all pretty well constantly rolling around on, rubbing up against, and/or attempting, in some form or another, to embed into their persons…most of their clothes are trashed. Which is fine because their play clothes were getting pretty worn out already, but, with our home school co-op starting in a week and 1/2 and cooler temperatures coming (ahem…in another 5 months), it was time to get a few “new” things for the chitlins. But wait. That’s not the confession. Here goes: I bought two things for me too. I had already determined that, given my self-imposed 6 month clothing fast, I wouldn’t even cast my eyes in the direction of the women’s department. And I didn’t. Pinky promise. HOWEVER, as we were entering the clothing area, there was a rack set up with a bunch of miscellaneous items on it. 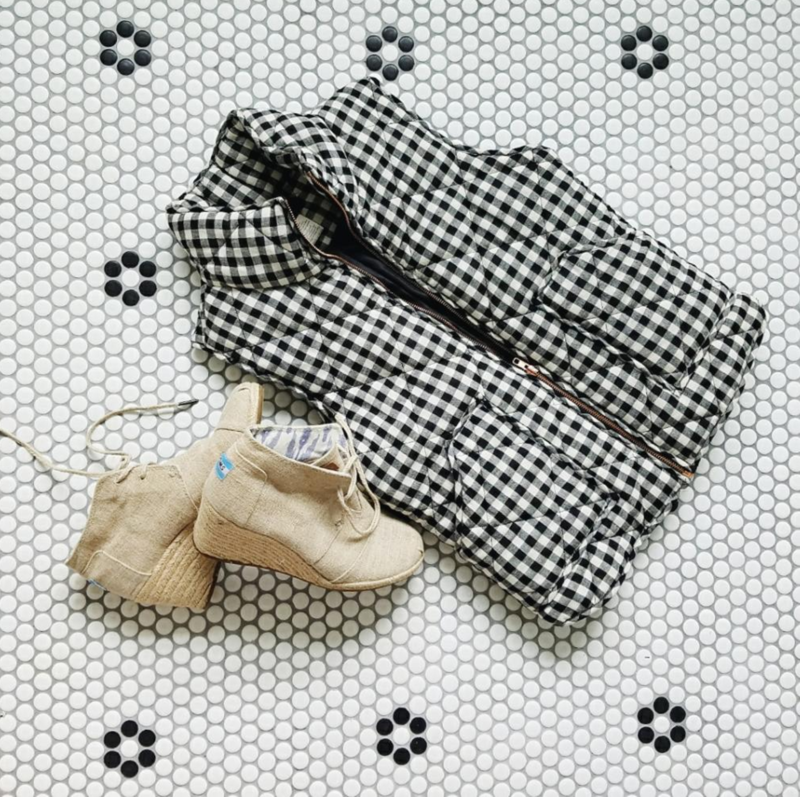 And what did my eyes behold but a pair of neutral TOMS wedge booties–the likes of which I have eyed up every fall season for the past 5 years. No lie. I just haven’t ever managed to make myself bite the bullet to buy an $80 pair of shoes that should cost half that (in my not-so-humble opinion). They were in fantastic condition, minus a faint gray mark on one (which I was pretty sure I could get out), and I snatched them up, squinting at the tag–half-hoping/half-fearing they would be my size. And you know what? They were! (Size 9–I have big feet), and, when I slipped them on, they fit like a dream. I put them in my cart and went on my merry way, not entirely sure I would buy them, but half giddy at the potential. I spent the next hour alternating between combing through the children’s racks, feeding Honor while standing up and combing through the children’s racks, and–toward the end–breaking up squabbles between the twins and Theo while combing through the children’s racks (for the first 45 minutes, they were playing happily with the toys, which Goodwill had had the good sense to relocate next to the children’s section). Halfway through all of this combing, I stumbled upon another item that I’ve had on my mental wish list for years: a black/white buffalo check puffer vest. I love puffer vests. In East Texas, we don’t have much use for full on coats–even during the winter–so puffer vests are a great way to stay toasty on a chilly (but still not truly cold) day. I have several, all of which I wear regularly in the colder months, but I’ve had my eye out for this particular style for ages. And there it was, wedged between a 3T tutu and a size 8 pair of jeans. Because that’s just how Goodwill rolls. It, too, had a small mark I was pretty sure I could get out but was otherwise perfect, and it fit! So, into my basket it went. I debated all the way to the front whether I would buy them and almost took them out of my basket several times, but in the end, buy them I did. Because, ultimately, the purpose of my fast is to eliminate impulse (“but it’s so cute and CHEAP!”) purchases of things that only ever get worn once and then spend the rest of their dejected lives stuffed in a closet corner–NOT to pass up good quality staples at great prices that I’ve had in mind for a long time. Anyhoo, I promised to keep you updated, and now I have, so there you go! Back to fasting! Moving on, can we talk about that pretty tile from the picture above? Except…and it’s a really big except. After the frenzy of getting moved in, things have slowed down considerably in the DIY department–partially because they finally could, partially because of summer, and partially because Shaun has been utterly slammed with his day job. That would be the master bathroom tiled with all of that lovely black and white penny tile. I chose gray grout to hide stains, but, unfortunately, the area in front of the sink ended up showing the grid patterns of the mosaic tiles (they come in approximately 1 sq. foot sections). Honestly, we’re not sure what happened. The area to the right where the tub will be does NOT show the grid lines. At least not nearly as noticeably. And the same person did the work almost entirely at the same time. So, why the application is so much better on the first 8 feet is beyond me. We ran out of tile. I mean, measure twice and install once, right, Abbie? You guys. I measure a GAJILLION times. And I ordered 10% extra for waste. But then, we decided to use the same tile on the shower floor. But even then, we did the math, and we should have been fine. Except that it turned out that a lot of the tiles had issues. Irregularities. Missing pieces, broken tiles. Etcetera. So, we ended up one row short. I ordered more from Overstock, thinking it would be no big deal. I mean, it was the same manufacturer, and I had only ordered the first batch last fall. The tiles were DIFFERENT. Not to the naked eye, really. Same design. But they’re slightly more off-white, slightly thicker (in height), and more beveled…all subtle differences that look anything but subtle once the gray grout is in. 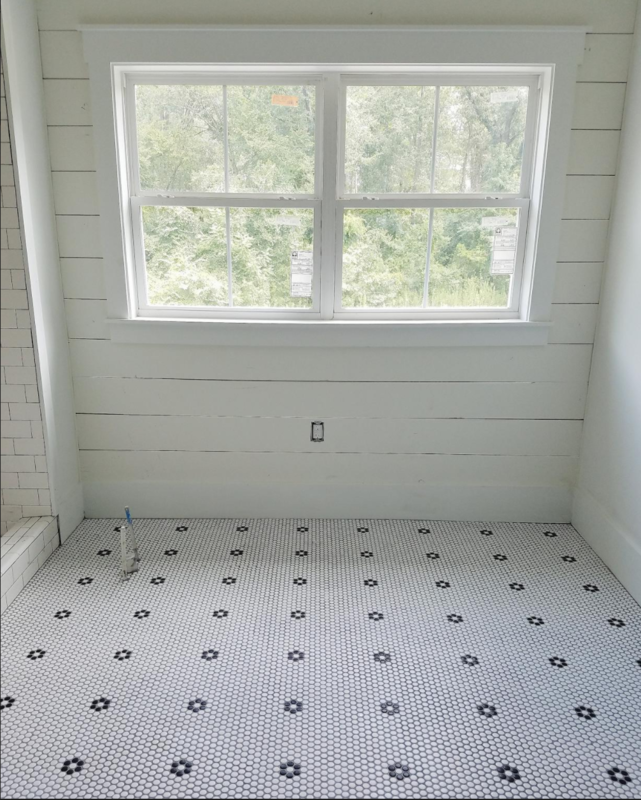 So, here we are, with half a beautifully tiled master bath, 45% a streaky, segmented mess of a master bath, and one ridiculous-looking strip of non-matching tile. It kind of makes me sick to my stomach because it’s so permanent. We haven’t really had any big uh-ohs during this build, for which I’m grateful. But I’m not going to lie. I’m pretty disappointed about this one. Which is where you come in. Has anyone else ever installed mosaic tile squares, only to have the squares themselves show up super obviously when grouted? I have a feeling I wouldn’t have even noticed the lines if we’d used white grout, but I also know the grout wouldn’t have stayed white-looking for long. If you have experienced this, did you find a way to fix or diminish the effect? We’re going to give the extra-thick grout lines a good scrubbing in hopes of minimizing the impression of segmentation, but I know that won’t completely fix it. 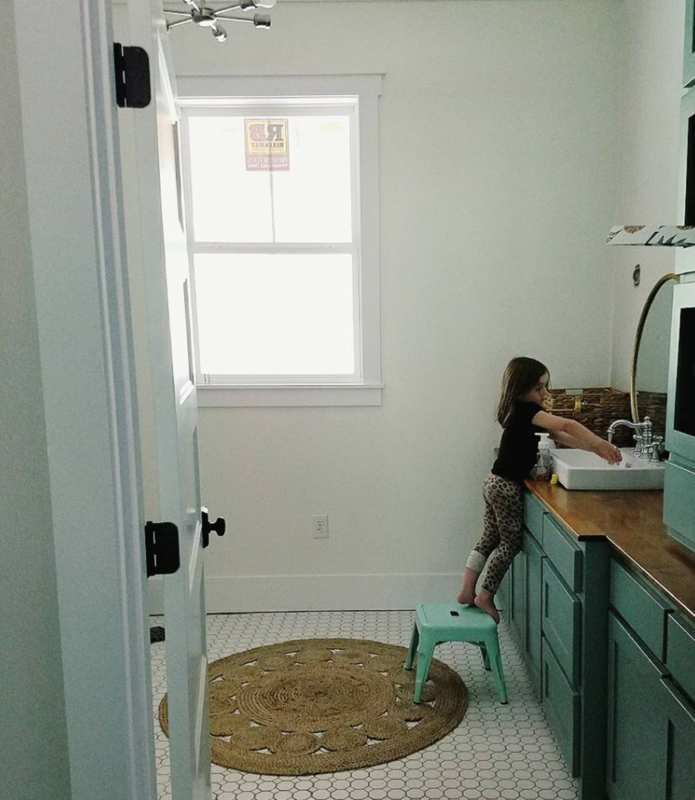 And when it comes to the non-matching tiles, there’s literally nothing I can think of but adding a rug runner directly in front of the sink to hide it. In the grand scheme of things, it’s no big deal. I mean, it’s a floor. In a house. Which is a blessing. We are grateful. In the small picture, though, I’d really love to find a way to “fix” it as much as possible. I’m so sorry! We experienced very similar tile trouble! We painted grout (terribly tedious! Esp for that amount!) I attempted cover up with rugs/furniture/accents but ultimately, we ripped it up & retiled (& I love it now!) as I always say, if you want something done right, you have to do it yourself. Even when you don’t have time/energy to do it yourself, you somehow find it bc just have to. Good luck & great thrift finds. I do not shop goodwill, due to their unethical practices, but I love a good deal! An area rug would cover it up. i don’t think it looks too terrible. But, while the tub is out and you’re doing it, I’d say rip it up and re-do. I lived in an apartment that had tile installed over other tile and there was cracking. Since it wasn’t my house I don’t know how well it was installed. So take it fwiw. I’d re-do completely while you’re in the middle of it and before the tub is installed. Good luck! Oh, the pain….when what you saw in your mind isn’t what you see when you first enter the room–it’s a horrible feeling. Wondering if once the whole room is done, maybe it would not necessarily “disappear” but be very diminished? 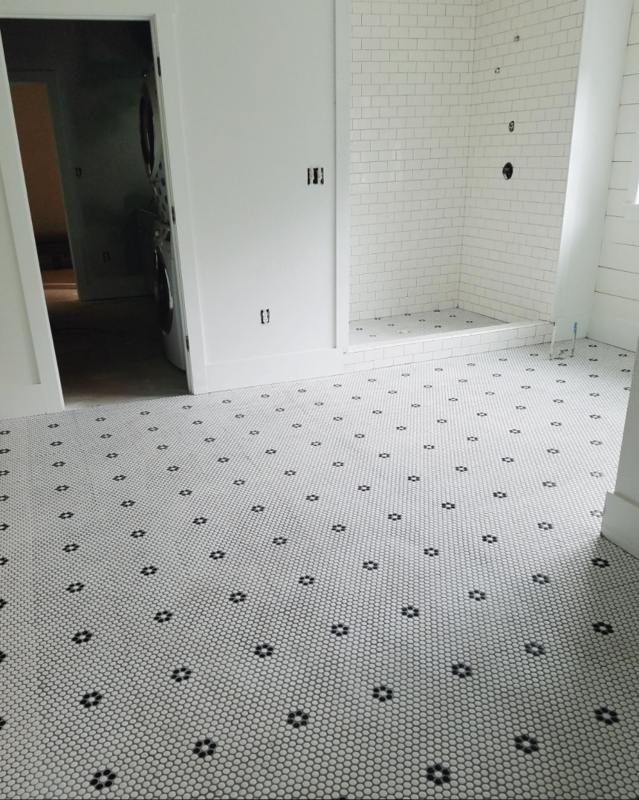 We had to match some tile in a bath renovation recently and wouldn’t you know it, but in 6 months the tile SIZE changed….1/4″ smaller. We had to strategically demo a few that were fine, and then have slightly larger grout lines where the new started. Bothered me terribly when it first went down but once the painting was finished, trim was installed, vanity put in place, lighting and mirrors up, the ever-present area rugs that need to be in a bathroom place, etc. I don’t really see it any more….and I haven’t even added any “finishing décor” in the room that would also help. Even better, my incredibly talented builder brother didn’t even notice…..and he always catches every little mistake! I honestly think you could try living with the imperfections. They may not bother you or seem as noticeable once it has been more lived in. Also, a pretty rug or two might work! Grout staining is tedious but it holds up perfectly. I’ve done white over dark and it looks awesome! Might I suggest it is something your oldest couple children could potentially do. Maybe 30 mins every morning or evening! It is very cheap too! I would suggest putting in a border all the way around and only ripping up that edge section. So then that white patch is gone at least. I love your awesome goodwill finds. They are currently on my boycott list in NE due to horrible community choices they have made here and other thrift stores aren’t the same!! We had the same issue with a similar tile several years ago. I do think it’s a difficult tile to work with. I tried to tell myself that I could live with it but in the end it bothered me so much we hired another contractor to tear it out and replace it. We ended up going with a grey wood look tile in planks with grey grout and it’s so beautiful. In the end I’m glad we replaced it. We made other budget conscious choices to offset the decision to replace the tile. I would live with yours “until the dust settles” and replace it at some point. I don’t have any ideas how to fix it but I’m pretty sure I bought this exact tile at lowes so you might check there too for your extra row. Such a bummer about the grout! If it makes you feel any better, I created a custom stain with a paint store, ok’d it on our sample, then the guys stained our entire house! All 3000sqft of it! But it was not the right color! The paint store messed up the mixture. Had to resand the entire house and start over! See? Thought that’d make ya feel better! We’ve painted grout before, Abbie, and it held up well for the five years we owned the house. I’m pretty sure we were switching from (not very) white to gray, though. Not sure how well it would work the other way. We also resurfaced the bathtub in that same bathroom though, going from dingy gray to bright white, and that stayed looking great as long as we lived there, too. That was all about 25 years ago, which means they probably have even better products to do such a job now. 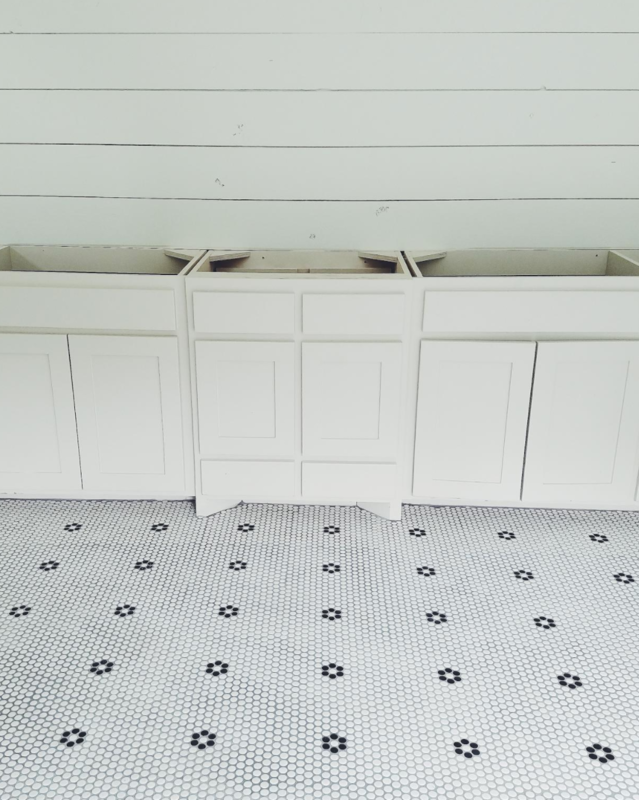 We had a tile disaster when our house was renovated from vandalism…any how. One sun contractor tiler did the dining room. One did the kitchen and they conjoined in a doorway. 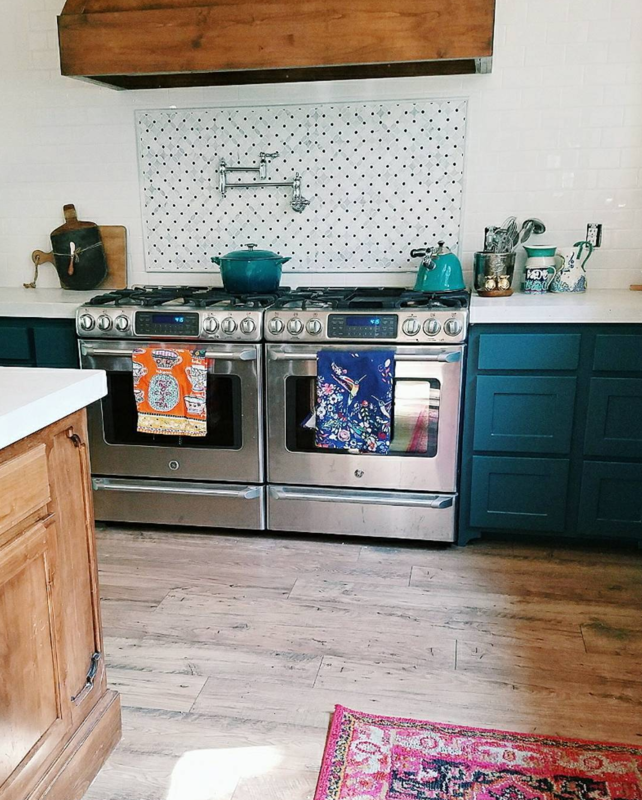 Lowes accidentally put the wrong grout color on the truck and we didn’t know until the kitchen was done a month later with the correct color = irrate 8mo prego, living in a hotel trying to supervise the Reno with a 2 yo…They came and painted the grout to match. I honestly have been super disappointed with the paint and it has only been two years (maipei) Granted, these are two light colors (biscuit). I have definitely and thankfully gotten dulled to it. But also won’t shop at lowes . Ok so this is kind of random, but I remember someone from IG- emilysuenetz, and they had the same situation. From what I remember they had to dig up all the tile and re-do it. I’m so sorry! I know she would respond to you if you messaged her! The guy that installed the tile did it wrong…. Thanks, Heather. I messaged her. Soooo… my husband is a tile setter by trade, a very good one at that. He said the only thing to “fix” the issue is to get a grout stain and stain it white. And pray that it lessens the eye sore. But that would be a VERY tedious task and almost not worth it. He said none of this is the installers fault and there’s nothing you can do with the whiter tile but place a runner. Unfortunately, in his option, your best bet is to rip it out and go a different route… or deal with the eye sore every day =/ Sorry, Abby. I was really hoping he would have another answer. Ugh. I was afraid that might be the case. Does your husband have any idea why one section would be consistent and one would show the lines so harshly? Can you grout over in a lighter grout? Maybe if it matches the tile more the lines might not be as noticeable. I’m not even sure if you can regrout but, what the heck!! No room for more grout, unfortunately. Completely stumped. oh that tile is gorgeous but i know how it feels to see that thing and then not be able to unsee it. bummer! and so weird! young house love painted their grout. which would be horribly tedious. would the man/woman who laid the tile come back to sort of clean up the job, or is this not his/her fault? can you please please tell how much you paid for the toms and vest? part of what i love about goodwill is how little you pay for things. we are in a university town with very southern/wealthy students and boy our goodwill can get some good stuff as a result. boden dresses and a few designer jeans were in my last haul. i love it. and paying $2 for a linen boden dress? jackpot. The shoes were $16.99. Which I thought was a rip-off for Goodwill shoes but NOT for near-perfect condition TOMS. The vest was $2. It was $20 well spent as far as I’m concerned.